This project gives you a wonderful opportunity to immerse yourself in the philosophies and ways of the Buddhist lifestyle. Learning the English language is considered very important for the 21st century monk children of Nepal as a solid grasp of English enables them to be better connected with the outside world. Not only that, if they want to progress to a tertiary education and study the likes of Engineering or Medicine, then a good grade in English is essential. Volunteers are placed in one of two monasteries located on the outskirts of Kathmandu. Each has around 40 young monks aged between 7 and 16, all eager to meet, interact and learn from you. You will work with the young monks of the monastery school, teaching English for 2-4 hours each day 5 days per week. Your attentive pupils are generally well behaved, if at times a little mischievous. Class times vary, but generally there will be one session in the morning and another late afternoon. The monasteries have been welcoming language assistants since 2008, and you will live and eat with the monks, getting to know them as you spend time with them. As you would expect, the monasteries are quite conservative so you’ll be expected to dress modestly. No visible tattoos or piercings please, and no drinking or smoking at the monastery. There is plenty of time free to plan lessons or to explore the local area. This is also the perfect opportunity to join meditation, rituals, prayers and songs with the monks, who will welcome your participation and interest. Day 1 (Saturday) Arrive at Kathmandu Tribhuvan airport and say Namaste to Nepal. After clearing customs and immigration, you’ll be met by our local team and taken straight to your arrival accommodation, a journey of under 30 minutes, depending on traffic. Day 2 (Sunday) After a good night’s sleep we’ll go through the orientation briefing when our team will educate you about Nepalese culture, dos and don’ts and how to stay safe. Then we take you for a tour to get your bearings in the exciting and vibrant city of Kathmandu. You’ll visit Durbar Square as well as the famous hilltop Monkey Temple at Swayambhunath, whose giant Buddha eyes gazing out over the city are one of the iconic images of Nepal. Have some rupees handy for entry fees. Day 3 (Monday) Today it’s time for school … a couple of hours of Nepali language class to learn the basics. Later you’ll head to Pashupatinath, one of the holiest Hindu temples sitting on the banks of the Bagmati River. A centre of spirituality, here you’re sure to meet colourful Sadhus, the wandering holy-men of Nepal amongst the hustle and bustle of devotion, worship and cremation. Later on today our team will take you to the monastery – your home for much of your remaining time in Nepal – you’ll be introduced to the monks and staff and given your schedule so that next day you can get right into your role teaching English. You’ll very soon find your rhythm in the classroom, and the experience is sure to be as much fun for you as it is for all the young monks. 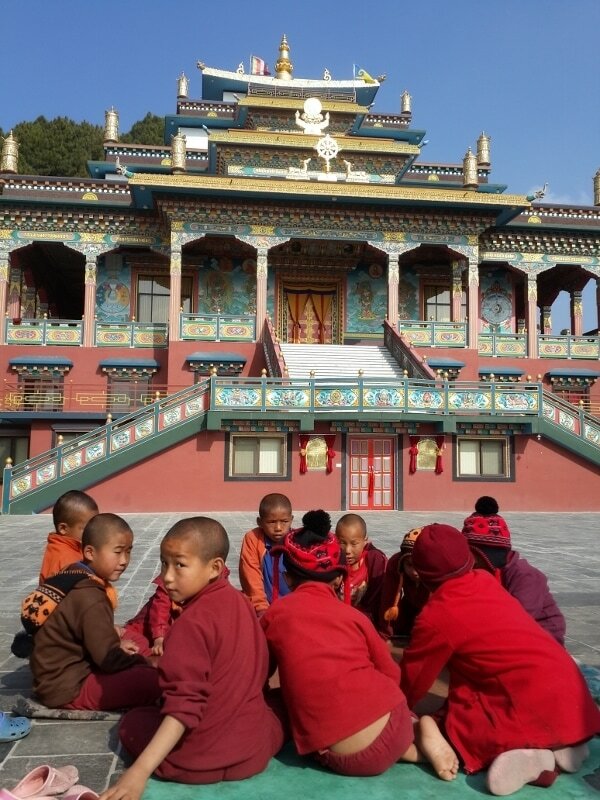 Your monastery classes will relish your presence and the young monks will love to learn from you. It’s a cliché, but the more you put in the more you’ll get out – prepare your lessons well and work hard to fill the contact time with your energy and enthusiasm – you’ll love the feeling when your students start to use your slang to banter with you (and the proper stuff too, of course!). Weekends Weekends are generally free to spend as you please. The ancient Kathmandu Valley cities of Patan and Bhaktapur are easily accessible as a daytrip, as are the Himalayan viewpoint villages of Dhulikel and Nagarkot. On stays of 3 weeks or longer, an exciting 3 day/2 night trip to famous Chitwan National Park is included in your itinerary. Chitwan is home to heaps of wildlife, including rhinos, leopards, bears and tigers and if you’re lucky you may get to see some if not all of these animals in the wild ! It is likely that you will go Saturday to Monday however your trip will be coordinated so that you travel with others, so it may be during the week. Transport to and from Chitwan is by public bus and you will need to budget around $55 for National Park entrance fees and meals. Your last day (Monday) – Oh no …… no matter how long you’re here for, one of these Mondays it will be time to say goodbye to your newfound friends. The return airport transfer is included, so you can relax as we get you to Tribhuvan in good time for your flight home. Namaste !! Accommodation Your first two nights as well as your last night will be spent at the home of our coordinator in the suburbs of Kathmandu, around 30 minutes drive from the tourist area. On trips of 3 weeks or more, two nights will be spent at a jungle lodge in Chitwan National Park. Both shared rooms, shared bathroom. The remainder of your time will be spent at the monastery. You will have your own room, shared with another teaching volunteer, in the accommodation block located safely inside the compound of the temple school. This accommodation is also home for the senior monks and the novice kids. A bathroom is shared between you, and whilst hot water is often available, it certainly cannot be guaranteed - hot water is considered a bit of a luxury in Nepal ! Bedding is provided – consider bringing a sleeping bag for extra warmth, particularly November to February, although extra blankets are always available.